At Currys we have the fridge freezer to suit your needs. Choose from our range of affordable AEG fridge freezers to keep your groceries fresh and tasty whilst keeping costs down. 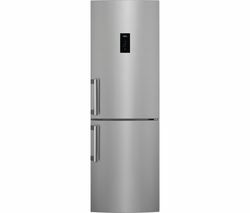 A well-priced fridge freezer will complete your home - select from white, silver and stainless steel appliances to give your kitchen a stylish accent. Our AEG fridge freezers offer a variety of space configurations for storing more fresh or more frozen goods, and you can choose a larger or smaller appliance to suit the dimensions of your kitchen and home. Twin thermostat models give you individual control over fridge and freezer compartments for perfect storage conditions. For added convenience, many AEG fridge freezers feature auto-defrost and frost free technology to take the hassle out of fridge maintenance. Consider a refrigerator with an energy rating of A+ or above to ensure low running costs.